This section of the site provides basic information, regular news updates and various links. The tropical island of Saint Lucia in the West Indies, was significantly impacted by major flooding, landslides and wind damage caused by Hurricane Tomas, a Category 1 hurricane that devastated the nation causing significant damage and taking lives. One village, Dennery, had only suffered freak flooding only two weeks prior to this catastrophic disaster. Access to many communities has been impossible or at the very least dangerously accessible. Some communities can only be accessed by sea, whereas those inland can only be reached by land or foot. Scores of people have lost their homes. Island wide there is a major water and food shortage. 1. SW London - High Commission For Saint Lucia. 1 Collingham Gardens, London SW5 OHW. Charlotte Despart Ave, Battersea Park Rd, London SW11. Tel: 0773-799 6495 or 0740-051 1214. 2. E London - A Hipp Service. Unit 17 Forest Business Park, Argall Avenue, Leyton, London E10 7FB. 3. SE London - Ms Roseline Felix, Dennery (St Lucia) Association. 121 Burford Rd, Catford, London SE6 4DB. 4. NW London - Mrs Sylvia Quinlan-Mercier, Unity Of UK St Lucia Association. 6 Marion Way, Harlesden, London NW10 4XJ. 5. Surrey - Mr Bertram Leon, Union of St Lucian Overseas Association. 16 Norfolk Avenue, Sanderstead, South Croydon, Surrey CR2 8BN. If you're able to make a donation, no matter how small, it will make a difference as every £ counts right now! Thank you and may God bless you and St. Lucia!! Fri 19th Nov 2010 - The Flooding Continues. Although the tropical wave is leaving St. Lucia, it again caused major flooding with even more torrential rain than yesterday. Bexon took a severe beating and they are in serious trouble with more water than they could possibly ask for. The east cost and west coast roads have reopened, but the Ministry Of Communications have advised motorists to proceed with extreme caution and not to drive unless you have to, due to the softening of the land and the possibility of more landslides. Unity Of UK St. Lucian Association have an update regards the event next month and the flyers should be out and about tomorrow. The association apologises for the delay as they were due earlier in the week and there were problems with the designer. If you want any flyers, please ring 0208-965-8079. Flyer for the fundraising dance next month. Thu 18th Nov 2010 - When It Rains, It Really Pours. A tropical wave is currently sitting above St. Lucia and causing major, widespread flooding. Clendon, a 9 year old boy was sent out on an errand and was reportedly playing with the drain water near a gutter/drain, he slipped down the gutter and drowned in Marchand/La Clery. Clendon sadly drowned in the flooding. Castries is flooded from the Chaussee Road to the Marchand Bridge. Staff in the Government Buildings on the Waterfront are trapped inside as water has flooded the buildings. The Ministry Of Communications & Works has ordered all staff to go home. They left the building through the rear fire escapes. Eyewitness reports state that water is 3 feet deep in places. The deluge of rain has caused even more landslides and the Bexon Road from Cul De Sac heading out to Barre Denis/Fern Gully is closed and the flooding of Cul De Sac means that transportation from Anse La Raye to Castries is not possible, plus the Roseau area and Soufriere are also flooded. Wed 17th Nov 2010 - SLU In Crisis Now On Facebook! In order to expand the reach of coverage and communication of this disaster, a Facebook page has now been created. the content is currently very sparse as there is so much to do but there will be information added on a daily basis. 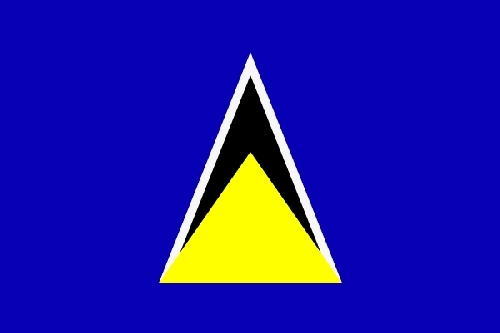 While in Facebook you can search for St. Lucia In Crisis or just click on the logo below. Please "suggest" it to as many friends as possible please, thanks! Mon 15th Nov 2010 - Unity Organises Fundraisers. 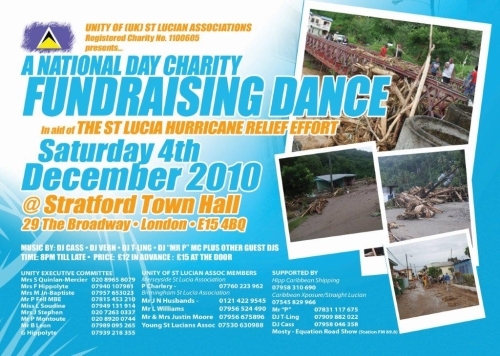 Unity Of UK St. Lucian Association, the official body that represents St. Lucians here in the UK and a registered charity, will be organising 2 fundraising events. The first will be on the Saturday 4th December 2010 in east London at Stratford Town Hall. Due to the timing of the disaster, Christmas around the corner and the urgent need of aid and funds in St. Lucia, this event has been swiftly organised to assist the people of St. Lucia. More details to follow soon. The second and bigger event planned will be in February of next year and will be star-studded with as many mainstream names as possible from the entertainment, business, showbiz and sports industries. More details will be available here soon. Sun 14th Nov 2010 - Aiasha Gustave Supports The Cause! The full extent of the destruction, damage and disruption caused by Hurricane Tomas continues to unfold. Much of the lands vegetation and crops, bananas in particular have been destroyed and many people have lost farms, livestock and livelihoods. Schools still remain closed except for Forms 4 & 5 due to exams. People have been praying for rain for well over a week now and the island has remained dry. There have been showers, but many of them just short and light localised showers, nothing substantial. Singer, model and St. Lucian representative for Miss World, Aiasha Gustave appeared on the The Sherry Dixon Show today joined by DJ Mr.P and they both gave updates and made appeals for people to assist in the crisis. If you missed the show, a podcast is available here. Aiasha Gustave and Sherry Dixon. Sat 13th Nov 2010 - Water Prices Soar And Miss St. Lucia Goes On Air. The squeeze is on for water in St. Lucia and it really has become a commodity. It's been reported that the supermarket chain Super J have hiked up the prices on bottled water. They are selling very fast, for those that can afford the prices, as much as $EC5 [£1.25] for 500ml of water! There have also been complaints that they have doubled the price on rice. The young lady representing St. Lucia in the Miss World international competition is St. Lucian born singer and model, Aiasha Gustave. The stunning and talented hopeful is genuinely concerned and very much behind the relief effort for St. Lucia particularly here in the UK and will be appearing on The Sherry Dixon Show tomorrow, Sunday 14th November and Sherry will be celebrating her first anniversary for the show. Get more details about the show. Fri 12th Nov 2010 - The Water Shortage Deepens. 16 people have died so far in this disaster and there has been surprisingly very little, in fact hardly any media coverage at all. St. Lucians in the UK are starting to become more concerned about the the lack of media coverage. The water shortage worsens as there is no rain forecast for the weekend and no hope of restoration of the water supply in the immediate future. Many people are relying on the water tanks, but that's for those that can afford them. The less fortunate ones have their water rationed which is making life very uncomfortable in the intense heat. Reports have come in that there are only 2 main water lines supplying the north of the island. The lines are running at a much reduced pressure which has been heavily rationed. The devastation caused by Hurricane Tomas is slowly revealing itself as there has been widespread destruction of the forestation and plantations. Hundreds of acres of banana crops around the island have been ravaged. Thu 11th Nov 2010 - St. Lucia In Crisis Website Goes Live! A new web presence appeared today online as a central point for information regarding the St. Lucian Hurricane Tomas Disaster, aptly named www.StLuciaInCrisis.org. It's a simple yet comprehensive site. It is packed with important information, news, photos and videos cataloguing the disaster. It will also have up to date information on the relief effort and fundraising initiatives that will be taking place in the near future. Tue 9th Nov 2010 - Being In Action. A badly decomposed body was found beside a river in Soufrieré but was unrecognisable due to the condition of the body. This now brings the death toll to 16. 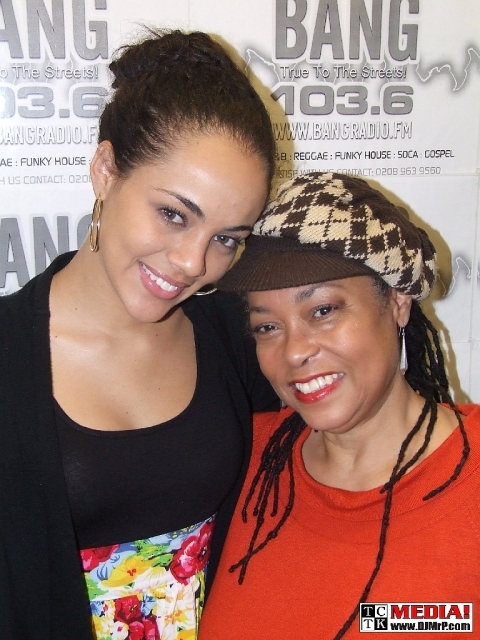 It was interesting listening to the Dilia Dolor's talk show on Radio St. Lucia last night. Many people, on and off the island are very much concerned about the state of St. Lucia, the lack of media coverage and are doing their utmost in the relief effort. Stories were told by peoples experiences of Hurricane Tomas and a popular DJ, Webby Dee was live in the studios and spoke of how he watched his house and all his possessions disappear underground before his very eyes. Mon 8th Nov 2010 - The Death Toll Continues To Rise. 15 people have now been confirmed dead and more people have been reported missing. We have heard that the Prime Minister of Trinidad & Tobago, Kamla Persad-Bissessar has made a public apology for her, what were described as her "selfish" remarks. Water rations are in place and schools are still closed. Delia Dolor of Radio St. Lucia contacted me for a live phone-in that went out last night in St. Lucia around 9pm local time, 1am GMT. Prior to having me on air she spoke with Steve Pope, editor of The Voice Newspaper based here in the UK and questioned him over the lack of media coverage in the UK. Sat 6th Nov 2010 - The UK Media DOES Exist! Well, well, well - what do we have here? Two national newspapers decide to report a little on the crisis on St. Lucia, or did they? I saw the piece in the Daily Mirror online [whether or not it went to print I don't know] but it was really about premier league footballer Jermain Defoe who feared his uncle perished in the hurricane. The Daily Telegraph did a similarly meagre piece. I'd had enough, Facebook is good, but not enough at this time and not everyone has a a FB account so I commenced work on this webpage. I was also reliably informed that Eddie Nestor of BBC Radio London covered the disaster extensively on his drive time show both on Wednesday and Thursday. 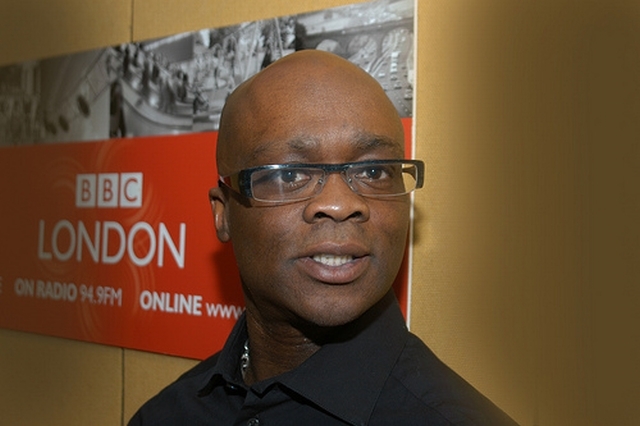 BBC Radio London's Eddie Nestor. Fri 5th Nov 2010 - The Pressure Continues. 14 people have died so far, 1 has committed suicide and 7 have been reported missing. There is a major water shortage which could take 3-4 weeks to restore, the search for survivors continue. NEMO have reported that the tropical wave has weakened and poses no threat although there are calls for the head of NEMO, Dawn French to resign. People are living in makeshift shelters. Many roads are are blocked from Barre Denis near Bexon towards the south, emergency access only. The village of Fond St. Jacques has been completely evacuated. International aid has started to arrive, the French have sent 3 ships, the UK sent 1. The people of St. Lucia are still very upset by the inappropriate and unsympathetic statement made by the Prime Minister of Trinidad & Tobago, Kamla Persad-Bissessar and there are calls for a public apology. The tropical wave has weakened and poses no threat to St. Lucia. 85% of the electricity island-wide has been restored. Ferry boats have been running from Castries to Soufrieré moving much needed supplies to the south. The government buildings and many shops have re-opened in Castries but with skeletal staff. Schools and other educational establishments remain closed and may be closed next week. The famous Ladera Hotel in Soufrieré has been badly damaged. Public pressure has now turned from LucElec to WASCO, the nations water company. I attended the crisis meeting with the Unity Of UK St. Lucian Association and we will be staging a huge, star-studded event in the second week in December. Keep an eye here for more details and on my Facebook page. Thu 4th Nov 2010 - No Sympathy From Trinidad & Tobago. The Prime Minister of Trinidad & Tobago, Kamla Persad-Bissessar was allegedly very insensitive, irresponsible and undiplomatic in her rather untimely and inappropriate statement about supporting St. Lucia and St. Vincent with aid, in assisting the nations through their current crisis [See Video]. 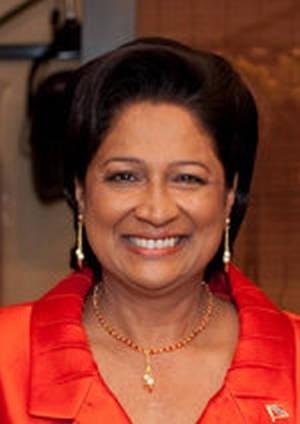 Prime Minister of T&T, Kamla Persad-Bissessar. She basically said that unless the T&T government can benefit from assisting the nations in question, they will not receive any assistance from T&T. The people of St. Lucia were very upset by this and see Kamla as putting business and money before peoples lives. Wed 3rd Nov 2010 - Matters Seem To Worsen. Hurricane Tomas has so far claimed 14 lives and many people are still missing. The weather warning from NEMO - the National Emergency Management Office is still in place regarding the incoming tropical wave which is weakening, but forecast to arrive on St. Lucia within the next 24hrs. The Prime Minister, Stephenson King has declared a state of emergency. There is a national food and water shortage. Consolidated Foods Distributors were badly damaged and much of their stocks which had to be disposed of. 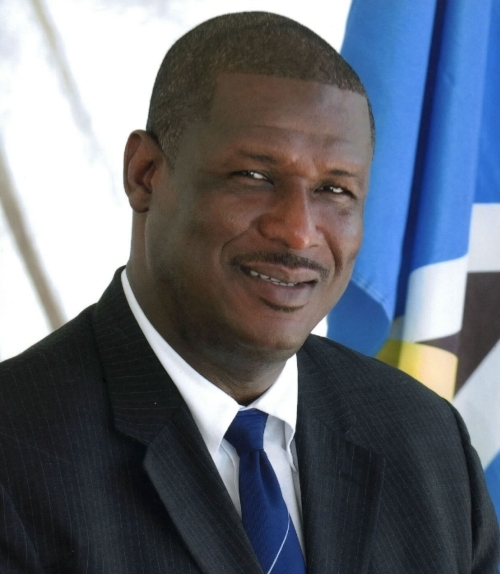 Prime Minister of St Lucia, Stephenson King. Communication links with Soufrieré and Vieux Fort remain very poor and they still have no power. Soufrieré is currently accessible only by sea and has received assistance by boat and catamaran. The international airport, Hewanorra in Vieux Fort is open but but only offering a shuttle service for small aircraft to and from Vigie Airport in the north as the roads in and out of the airport are very badly damaged. The bridges at Choc and Bois D'Orange in the north are working temporarily for non-commercial vehicles. Despite warnings from the Ministry Of Transport, drivers are not using alternative routes and long queues have formed as a result. I was able to speak with Brenda Emmanus from BBC News who said she would see that a report will go out in the evening news. I did receive a call from Eddie Nestor of BBC Radio London, but was indisposed at the time. I rang back but was still unable to speak with him. Facebook is alight with activity and many Lucians online have used this as a medium for communication throughout this disaster. I was invited to a crisis meeting regards fundraising solutions for the disaster. Tue 2nd Nov 2010 - More Aftermath Revelations. The death toll now stands at 14 and many people are still missing. NEMO - the National Emergency Management Office warned that a Tropical Wave is forecast and on course for St. Lucia. There were fires in Castries and on The Morne. The fire station in Castries was under nearly 4ft of water. The 2 bridges in Bois D'Orange and Choc are now open temporarily for non-commercial and non-personal traffic only. People have been heard complaining about the electricity board, LucElec live on air about food starting to rot in their fridges due to the lack of electricity - PARDON??!!! It's also been reported that unscrupulous people have been selling beef from cows that drowned in the Cul De Sac area. Gros Islet bus drivers have been extorting passengers and charging them nearly double the fare to travel up north. Looting has taken place in Soufrieré but for alcohol not food - HELLLLOO??!!! The cellular network companies have lent a helping hand, Digicel granted more generously by supplying all customers with $10 credit, Cable & Wireless only gave $5. Prime Minister Stephenson King and minister of tourism, Michael Chastenet were heard crying live on air. The PM made a plea for international help. Martinique responded with helicopters on a search and rescue mission to Soufrieré and Vieux Fort in the south, the worst affected areas. Communication down there is very poor and they still have no power. The areas of Babbonneau and Vanard have had many landslides. Millet has been cut off to Vanard by road with roads that are blocked and have collapsed. There is now way into Vanard as the road from Roseau is blocked and the river at Sarot burst it's banks and flooded the are making it impassable. What's going on with the UK media? There is nothing on air, in the press or online! I'm becoming more and more frustrated with this total lack of attention. I then updated my Lucian database via Txt and my Facebook pages. Mon 1st Nov 2010 - The Aftermath Of Hurricane Tomas. 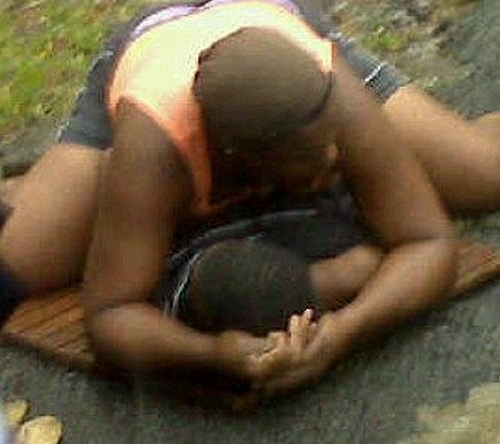 The weekend was a very grim one for the people of St. Lucia - both on and off the island. The death toll so far has reached 9 and the authorities fear it will rise. A family of four who own and run Sarbis Arts & Crafts in Soufrieré died when a landslide took their home and shop. A mother and her 2 children died in Fond St. Jacques, Soufrieré. 3 more people are reported missing in the area. There have been at least 15 landslides between Soufrieré and Vieux Fort. The main airport, Hewanorra, is badly damaged and may not be fully operational for up to 3 weeks, but Vigie Airport has some functionality. In Bexon, most of the banana trees have been flattened and people had to evacuate their homes due to landslides and mud floods. There is no access by road to Soufrieré from either side, only by boat. There have been many landslides in the area and the road to the Sulphur Springs has had irreparable damage. Barre Denis aka Fern Gully has suffered numerous landslides and there is still no contact with Vieux Fort in the south. Four houses were lost to landslides in La Croix, seven in Ti Rocher and there have been extensive landslides from Trois Piton in Ti Rocher, Castries through to Bexon. There have been reports of mud floods in homes as high as 8 feet. Work is in progress on the Choc Bridge, but with limited access. The Bois D'orange and Corinth/Mariseul bridges are still down. The Blue Coral Mall in Castries was the scene of looting last night and the Castries River burst it's banks flooding the city with mud. Hurricane Tomas has been downgraded to a Tropical Storm as it heads out West/North-West into the Caribbean Sea. The UK media seem very slow on the take up of this. I've seen very little apart from a small paragraph in Metro newspaper and a few lines on the CNN website. I will now try to reach my contacts at the BBC, CNN and Sky News and send out a Txt alert to 1,800+ people and updated my Facebook pages. Sun 31st Oct 2010 - St. Lucia Devastated By Hurricane Tomas. What started as tropical storm Tomas on Friday, turned into a Category 1 hurricane yesterday. By midday local time, the capital city of St. Lucia, Castries was effectively shutdown as the authorities suspended power and closed the airports as they were in a state of alert due to the anticipated arrival of the tropical storm. By the early afternoon, the east coast village of Dennery was hit quite severely with roofs being ripped off the hospital, school and boathouse. Many houses also lost their roofs, power lines, telephone poles and scores of trees were all down. The parish of Vieux Fort also took a beating with many houses losing their roofs and suffering bad damage. By the late afternoon, power had been suspended for the whole island so they spent, what I imagine to be, a REAL scary night in complete darkness, as opposed to Halloween "celebrations". Tomas raged on through the night causing as much mayhem as it did damage. St. Lucians woke this morning to experience and see the mess and melé caused by Hurricane Tomas. It was not at all a good site to see as the roads in Castries were not visible because they were brown with floodwater - the city centre was completely flooded. TV, radio stations and communication lines were down, but the cellular networks continued to deliver a partial service. Many roads were blocked by fallen trees, mud and debris, the bad weather continued with high winds and rain. Tomas has now left St. Lucia but had been upgraded to a Category 2 as it gathered strength with wind speeds of over 100 mph and is heading west/north-west, very slowly, towards Haiti and Jamaica. In Ti Rocher, a road caved in bringing several houses down with it. In the north, the Choc Bridge and the Bois D'Orange bridge collapsed preventing transport via the main highway. In Biseé, a house "disappeared" only leaving the fridge and stove. Canaries had mud slides and some people were trapped in their homes due to flood waters and mud. Part of the roof of the international airport in Vieux Fort was ripped off. In Ciceron, there is an electrical fault with live wires arcing and transformers exploding. There have been two reported casualties so far, a young lady aged 31 went off a precipice in a vehicle and a non-national drowned at Cas-En-Bas beach. The waters have now subsided in Castries but leaving the city covered with mud and silt. There is one supermarket that opened today but people are panic buying and most, if not all of the supplies like bread, water and batteries have been sold. Helen 100 FM came back on air, but it's the only station running presently and the broadcasts are temporary. Helicopters which we believe Prime Minister Stephenson King was aboard flew in a few hours ago and I'm told that electricity in Castries has just been restored but much of the island is still without power. It will be sometime before this mess will be cleared up as much of the land had extensive damage and the Prime Minister Stephenson King announced today that due to the devastation caused, government, public sector and commercial workers will be granted the day off tomorrow. He is also considering putting a curfew in place. I've not seen any media reports on this as yet so I sent out another Txt alert and updated my Facebook pages. Sat 30th Oct 2010 - Windward Islands Hurricane Alert. Tropical Storm Tomas has hit the West Indies. Reports have come in so far from St. Lucia that the roofs of the hospital, school and boathouse in Dennery has been ripped off, houses in Vieux Fort have lost their roofs, many electric lines and trees are down. The capital city of Castries will be in darkness tonight as power has been suspended. In neighbouring St. Vincent and Barbados, the islands have sustained damage as several houses have lost their roofs. I rang the alarm via SMS to all the Lucians here in the UK and on Facebook. Information will be added here soon. In the meantime, please send us an Eml or join us on Facebook. Thank you for visiting us and we ask that you spread the word about this site!